Fraternities do a ton of good stuff for both their brothers & their community. They also do a lot of dumb stuff which often gives them a negative image. The following list are common things some fraternities do that if corrected will improve their chapter and themselves tenfold. Hazing is bad on a bunch of different levels and one of the most stupid things fraternities do. Besides being against university, fraternity and federal law – it also isn’t really that much fun. If your fraternity hazes, think about your last pledge period. Was is like pulling teeth to get brothers to come to pledge events? That is because hazing isn’t much fun for the brothers. As a leader – you are better than that. Become creative and come up with pledge events that build and teach your class while providing a good time for both pledges and brothers. Participation will increase, and your brotherhood will become stronger as a result. I have buried a brother due to a drunk driving accident. This is an epidemic for all college students – not just guys in fraternities. If you need a ride, call the house and get someone to pick you up. The alternative just isn’t worth it. Every Greek hates the ‘Why Buy Your Friends’ and ‘Greeks Just Party’ crowds. These people are either jealous of your organization or ignorant to all the good things you do. Don’t feed into their stereotype by doing something stupid in public. That type of news spreads 100x faster than the news of all the great things you do. College guys don’t have money. Unfortunately, being a brother in a fraternity isn’t cheap (even though it could be). 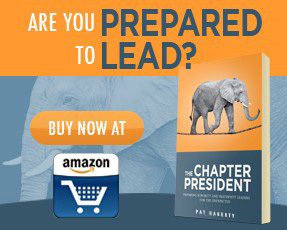 The leadership team needs to be good stewards of the fraternity finances to ensure that every brother feels they are getting tremendous value for their dues. Your chapter website is one of the most powerful tools your fraternity has to show how great your organization is. It can become a fantastic recruitment tool and can even earn you a few bucks. However, chances are your site is out of date and no one knows about it. The solution is simple – post tons of pictures and spread the word about your site. You can start by getting your site listed on our chapter roll. Beer cans, dirty dishes, nasty bathrooms, dirty clothes, empty pizza boxes, beer cans, cigarette butts, over flowing trash cans, beer cans, and sticky floors are just a few of the nasty things you can find at a fraternity house. This isn’t the environment that anyone should live in, and is a poor reflection of our quality organizations. Guys who join fraternities are scholars and leaders. Chances are, they have busy academic loads to go with a girlfriend, work, other organizations, family and fraternity. Sometimes, less is more. The fraternity should limit the mandatory functions and focus on quality instead of quantity out of respect to the brothers busy schedules. It always amazed me how fraternities allow some brothers to become thousand in debt to the fraternity. More times than not, the fraternity will never see this money. Don’t let deadbeat brothers take advantage of the chapter! Fraternities spend gobs of money in forced-fun events at the beginning of every semester. The intent is to impress enough naïve freshman to join the fraternity. The reality is guys don’t join because of events, and the money could be better spent on the brotherhood later in the semester. Some of the best fraternity brothers I know never made it to graduation. They were great brothers, but their time with the fraternity is too short. It was such a waste. + 1 – Let me know what I missed! honestly, this is a puff piece written by a guy obviously not ready to move on from college. you want “brothers?” try joining the military? you want to continue high school and institutionalize cliques, thus negating the “awakening” most experience while moving to college and experiencing the big, vast world outside of your home town? join a frat. you won’t have to adjust at all. I am always surprised, though I really should not be, at the negative responses to this post. Pat, Dennis, and I, along with many others are here to try to help lead Greek men in the right direction. I’m sorry that not every experience has been positive for every college man. Our Greek system is not perfect. There are flaws enough for us to want to work on a site like this to make it better. My question to every critic is this: what have you done to make a difference? This is not a challenge to your views or a dismissal of your opinion. College men join fraternities for the history, tradition, and to be a part of a collective bigger than one man. If not a Greek organization, there are options abound. It’s easy to stand back and judge without having any skin in the game. My challenge the is this: go out on campus and in the community to make a positive impact. My experience with my chapter got me involved in some charities that I am still active with today. How about YOUR investment in your campus or community? Again, Greeks aren’t perfect, but there’s much more there than some of you are recognizing. Look, whether or not this was written by a Greek, everything he says is true. Ive was apart of a frat for about a semester and it really was one big academic, emotional, and financial hassle. We had every problem on this list except 9 (which I am thankful for). Having a president that is too focused on pleasing the national office rather than actual brotherhood doesn’t help the situation. It was drama all the time. we tried so hard to do so much only to get nothing done by lack of motivation. and to be honest, the fraternity pushed a lot of false attributes about itself to make us want to join (which I’m pretty sure every fraternity does) . One good thing did come out of it though, my big brother was always honest with me and we became very close, then i left and we never spoke again. So, If anyone reads this, decide for yourself what is “cool” before someone else decides for you. If frats were like they were a few decades ago (Animal House) i definitely would have considered staying, but not when it’s all about money like it is now. Not meaning to bash on the whole fraternity system, but my experience was bad, and I’m sure I wasn’t the first to make this mistake, but hopefully I can help keep this from happening to someone else. Very interesting comment on #11. Your opinion seems to miss the fact that Greek organizations have cultivated an overwhelming number of the corporate and civil leaders in this country. You also forget that Greeks donate 75% of all money donated to universities. Studies have shown that Greeks are more likely to participate in community service activities than non-Greeks. Finally, and most importantly, members of Greek organizations have a 10% higher graduation rate than their peers. It is very dangerous when you try to stereotype an entire group of people like you have tried to do. Your comment comes off as ignorant and misinformed. It seems like anyone who became a civil or corporate leader would have done so anyway, with or without a fraternity/sorority. I don’t think being in a fraternity cultivated them into having the necessary qualities so much as it gave them something else to put on their resume. As for the higher graduation rate, that can easily be attributed to being a part of something and therefore having a larger interest in school. One could do that with any club. If you’re a part of a group that you enjoy, and they revolve or focus heavily on your academic life as well as whatever they do, of course you’ll do better/continue doing good if you want to stay in it. Long story short, I don’t think the evidence you cited is exclusively because of fraternities, it seems moreso like a big coincidence that could’ve occurred either way. The type of people that benefit your statistics surely already had these traits and would’ve succeeded either way. Fraternities are outdated, archaic and really inclusive groups of young, naive men who adopt a group think mentality assuming it will enable them onto a path of self-preservation. In reality, they would do fine joining any other non-inclusive student club that is available at their universities, and focusing their efforts towards their communities and family. Ah, I do wish fraternities were more considerate of their probationary member’s time.